CES 2013: Wireless speaker joins Philips Fidelio range | What Hi-Fi? 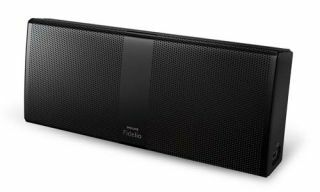 Coming hard on the heels of the recent announcement of new Fidelio soundbars and headphones, Philips has released its first Fidelio portable speaker, the P8, at the International CES in Las Vegas. The speaker works with Bluetooth for simple wireless streaming, and there’s an audio-in to connect devices without the facility for Bluetooth. The Li-ion rechargeable battery will fire out tunes for a claimed eight hours, and you can charge devices such as smartphones via a built-in USB port. It comes with a protective pouch for safer transportation, and should be available soon (US launch date is set for March). Price in the US will be $200.